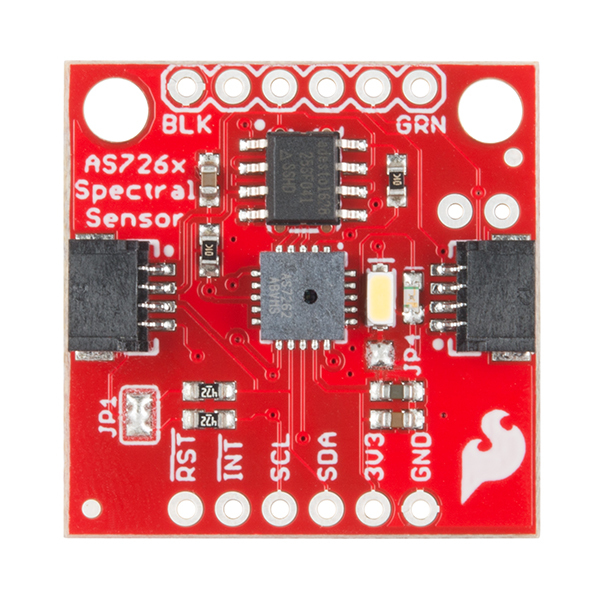 The SparkFun AS7262 Visible Spectral Sensor Breakout brings spectroscopy to the palm of your hand, making it easier than ever to measure and characterize how different materials absorb and reflect different wavelengths of light. 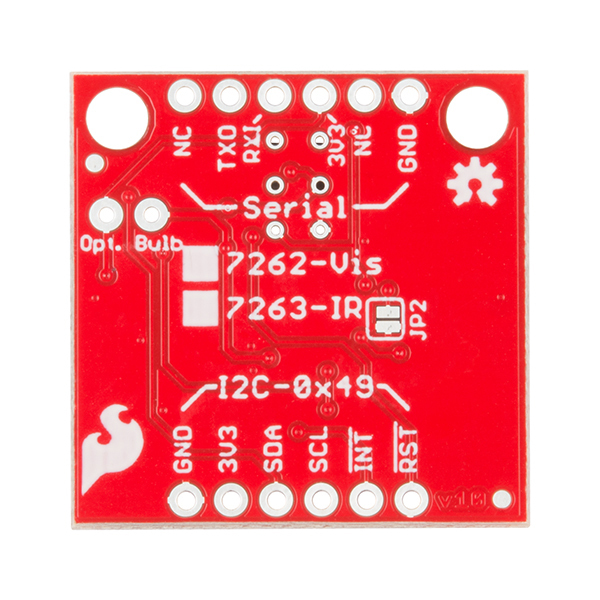 The AS7262 Breakout is unique in its ability to communicate by both an I2C interface and serial interface using AT commands. Hookup is easy, thanks to the Qwiic connectors attached to the board --- simply plug one end of the Qwiic cable into the breakout and the other into one of the Qwiic Shields, then stack the board on a development board. You’ll be ready to upload a sketch to start taking spectroscopy measurements in no time. The AS7262 spectrometer detects wavelengths in the visible range at 450, 500, 550, 570, 600 and 650nm of light each with 40nm of full-width half-max detection. The board also has multiple ways for you to illuminate objects that you will try to measure for a more accurate spectroscopy reading. There is an onboard LED that has been picked out specifically for this task, as well as two pins to solder your own LED into. It's now easier than ever to measure and characterize how different materials absorb and reflect different wavelengths of light. 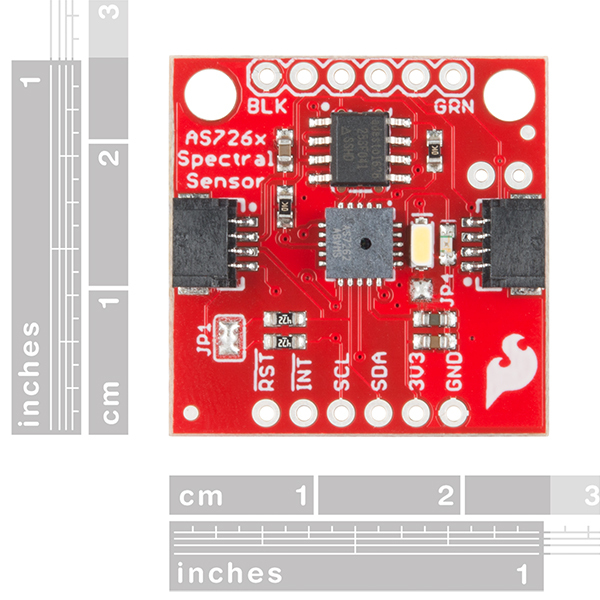 The AS726X spectral sensors allow you to detect wavelengths in the visible range (VIS) and near infrared range (NIR)! The flash memory on the board is only rated up to 3.6V. Do not use a 5V UART/FTDI connector to power/communicate with the board. Apparently, apart from the AS7262 and AS7263, AMS also makes a AS7261. That one would be able to produce X Y Z CIE coÃ¶rdinates. See http://ams.com/eng/Products/Spectral-Sensing/Multi-spectral-Sensing/AS7261 . Other interesting chips are the AS7264N and AS7265 , the latter delivering even 18 sensor channels. Would these chips be usable on the same breakout board? Has Sparkfun any intentions to produce a breakout for any of these too? 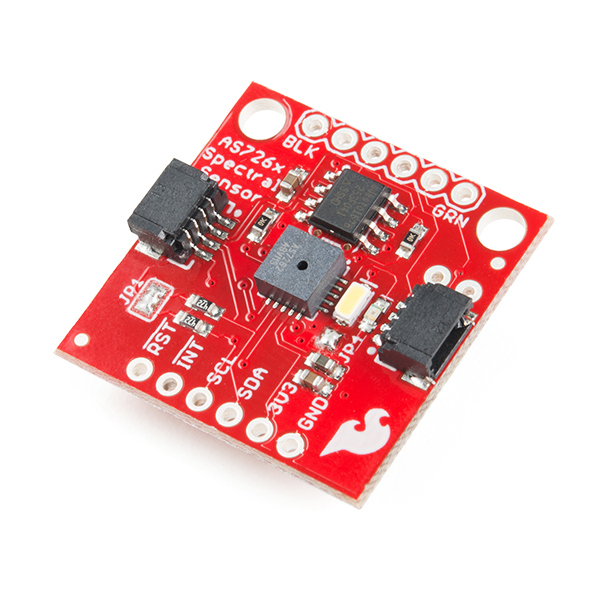 I just got the sensor and the SparkFun Serial Basic Breakout - CH340G. Has anyone used the Serial communication to control the sensor? I was playing with the visible spectrum version a bit. I have connected it to an Arduino via an standard i2c 5V -> 3.3 V level shifter. By now I am just using it for transmitted light measurements, using a warm white LED as light source, and some ROSCO color filters as objects. But you may also use it to perform measurements using solutions. I would link to use the sensor on a Raspberry Pi. Is there an example code for the Raspberry available? I've worked with a lot of spectrometers, etc. in the past. I had hopped that this would work as a spectrometer, it doesn't. The filters are only somewhat effective. My first test involved using a UV LED. This LED only outputs light from ~290-~340nm. The AS7262 showed light coming in on all channels, including the 650nm (even though there was no green, yellow, orange or red light coming from my LED). This is the same problem you'll experience using thin films like those used in popular PublicLabs projects (usually Rosco filters). This is still a cool device, probably good for something. And the signal quality is pretty decent (nice ADC S/N) but the readings are by no means accurate. Hi. I can`t find any information about the purpose of Flash-chip and the possibility of working with AS726x without it. Could you please make it clear for me? So I bought this an the NIR version. Both have the same I2C address? How can I use them at the same time? This looks about right for building a homebrew monitor profiler that actually yields useful results. It's not quite the 7 filters or whatever a Spyder has, but it's probably enough to find the color primaries of a screen in XYZ or LAB. You could not, the conventional camera sensor only has active pixel sensor's for red green and blue (Only 3 channels are necessary as these are what you need to produce an image on any RGB display, we only need this many channels for image production as the human eye only has 3 different types of cones) The AS7262 series has 6 different channels, allowing for detection of wavelengths in between red green and blue; something your average CMOS sensor is incapable of. The AS7263 senses 6 different wavelengths in the near infrared spectrum, something most cameras are not equipped for. (unless you happen to have an infrared camera) These sensors also use a silicon Interference filter as opposed to the active pixel sensors used in a CMOS sensor. This gives them a narrower band of spectral sensitivity. In short, you wouldn't be able to accomplish the same with additional signal processing and a camera due to the fact that these sensors are able to detect twice as many different wavelengths as the traditional camera. Thanks Englandsaurus, really appreciate the explanation. So, just for my own edification, let's say I have a pure yellow signal that I want to detect (i.e. centered right at, say, 570nm with very low bandwidth). The AS7262 would be able to pick that up loud and clear with the dectector centered on that wavelength. With a conventional RGB image sensor, however, the more "pure" that signal is, the worse the signal to noise ratio becomes, because there is less signal bleeding over into the RGB part of the spectrum for the RGB detectors to sense. Am I close? Thanks, again. Plan to buy a few of these to play around with. Absolutely! CMOS sensors incorporate Bayer Filters to separate light into it's red green and blue components. I am unsure of the spectral range on many of these Bayer Filters, but your interpretation in the above comment is spot on. You would see some signal pop up in both red and green, but it would probably be noisy, and you'd have to account for the spectral range of each Bayer Filter (no fun) in order to correctly read your values. Does this Board come with the preprogrammed FirmWare (for the Sensor) in the Flash-Chip or do we have to program the Flash ourselves? And what is the difference between the raw and the calibrated data? Are the calibration parameters also in the Flash and who performs the calibration, AMS, Sparkfun or the end-user? Don't worry, Flash is pre-programmed so you won't have to muck about with all of that. Calibrated data is read from four registers on the AS726X and converting to a 32-bit float, while raw data is read from 2 separate registers. Calibration is performed by the chip using a stored correction matrix provided by AMS. Hope this helped! Thanks, that sounds perfect. It seems, this module combined with a wide spectrum LED as a light source would be perfect for a DIY fixed wavelenghts (6 channels) small photometer for digital readout of some colorimetric water tests (after calibration curves with the corresponding standard solutions have been calculated of course). What do you think? Sparkfun and other do a great service by making breakout boards available for surface mount parts like this. I have hooked this board up to a teensy 3.2 and run the available software. The board seems to work just fine. I am in the process of building and instrument that will use this board. When that instrument is built and operating I will write a blog article on it. Until then I can't say much more than it works. BTW I also purchased the IR version of this board.